Going on an egg hunt? 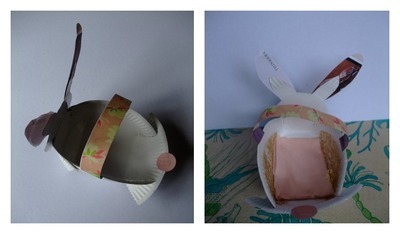 Here's a quick and easy way to make an Easter Rabbit Basket. Cut into four parts of the paper plate, like a cross. Fold two sides up at a time and tape them in place on the inside of the basket with clear sticky tape. Cut rabbit shaped head from a paper plate. 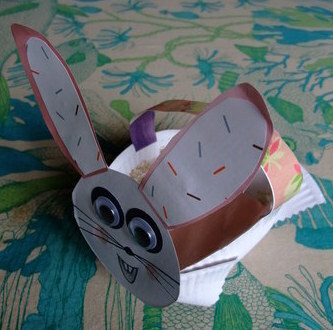 Using coloured paper/ paper from magazine, make rabbit ears and glue to paper plate. Draw on whiskers and teeth. Glue on googly eyes and sticky tape rabbit head to rabbit body. With coloured paper, glue on a handle for child to hold. Decorate interior with crepe paper - soft landing for the chocolates. Fill with carrot chocolates or Easter eggs.